St Michael's Church in Ryston is the estate church of Ryston Hall. In its heyday over 100 years ago Ryston Hall employed more than 100 domestic staff who would have filled the pews on Sundays and Saint's Days. However, since then staff numbers have dwindled. One of the windows in the church dates from the 13th or 14th century and the two lower pieces of stained glass are thought to be original (the upper blue section is a more modern replacement). 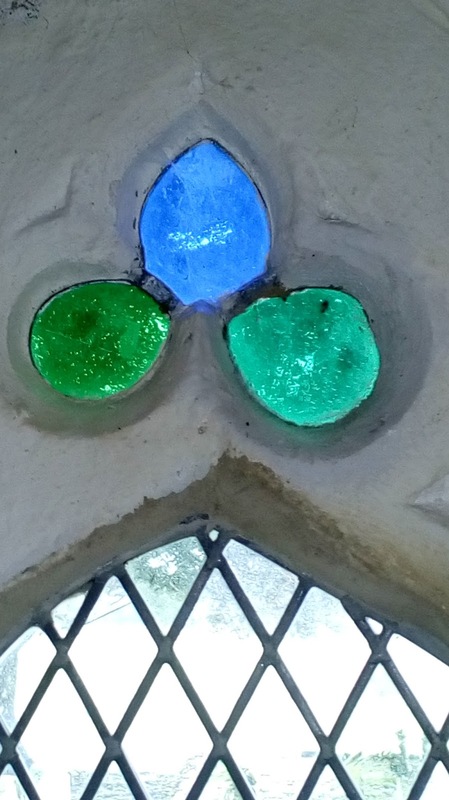 The original stained glasses are both flawed and contain tens of tiny air bubbles trapped in the glass. This gives a very spectacular effect when the sun shines through but glass of this quality would have been totally unsuitable for use in astronomical equipment. The Digges-Bourne telescope uses a plano convex lens, which was probably in the first instance a spectacle lens, and a concave mirror. Both items were available in good quality in the Tudor period. Fortunately the Digges family were wealthy landowners and could afford to purchase such items. Despite its low magnification and its backwards use the Digges-Bourne telescope had the massive advantage that it could be easily made from "off the shelf" items in the Tudor period. Like the Digges-Bourne telescope Galileo's telescope also used a plano convex lens as the objective but then used a plano concave lens as the occular instead of a mirror. Whilst Galileo was able to buy a ready made spectacle lens for his first telescope the plano concave lenses of the type Galileo needed for his occular did not exist at the time in 1609, so he was forced to make his own. Fortunately Galileo was a very practical man and produced a 10X magnification telescope in August 1609. Details of Galileo's telescope construction experiments can be found in his book Sidereus Nuncius. This book is the perfect model for scientific reporting. Galileo sets out his objectives, describes his methods and results and then draws conclusions in an easy to follow text so that his work can be repeated and independently verified. It is truly a scientific masterpiece.